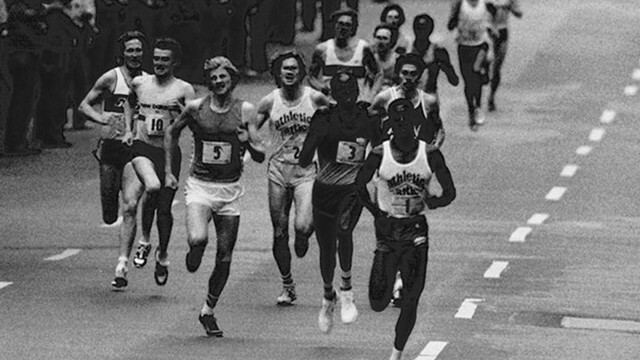 It's been 29 years since the first 5th Avenue Mile was contested in New York City. Two Villanovans figured prominantly in that race (and subsequent ones as well). Eamonn Coghlan helped organized the race and recruit the excellent field, and Sydney Maree won the race in a spectacular 3:47.52, which remains the fastest time in the 29-race history. With the 30th running of New York's Fifth Avenue Mile, the oldest road race of its kind, coming up, four of the participants in that first race -- Eamonn Coghlan, Steve Cram, Steve Scott and Ray Flynn -- reflect on their Big Apple adventure in 1981. On September 26, the New York Road Runners will host the 30th running of the Fifth Avenue Mile, the oldest road race of its kind. To mark the occasion, four of the participants in the 1981 race -- Eamonn Coghlan and Ray Flynn of Ireland, Steve Cram of Great Britain and Steve Scott of the U.S. -- spoke with a select group of reporters about that initial road mile as well as the state of the sport today. Here are their recollections of the 1981 race. What is your first memory of the Fifth Avenue Mile? Eamonn Coghlan: I remember coming out of Madison Square Garden after the Millrose Games Wannamaker Mile, and as I was walking over to the Penn Plaza Hotel with Fred Lebow, Fred said to me, ‘It's a shame that we don't get more people watching you great milers compete. I have an idea. I'm thinking about putting a mile down Fifth Avenue. What do you think?' I said, ‘Gosh Fred, I think that's a great idea. Why don't you finish it at the Irish Tourist Board on Fifth Avenue.' I was working there at the time. In Oslo about four months later, Fred said to me, ‘Hey Eamonn, I have a sponsor for the Fifth Avenue Mile. It's going to be called the Pepsi Challenge Fifth Avenue Mile and we want to fly you over for the press conference on the Concord.' That was the birth of the Fifth Avenue Mile. How did Fred Lebow pitch the idea to get all of you guys into the field? Eamonn Coghlan: It was totally different from what it is like today trying to get the best milers in the world to compete. Back then, we didn't hide - well, maybe Seb Coe and Steve Ovett did - but John Walker, Ray Flynn, Steve Scott, Thomas Wessinghage, Steve Cram, we went at it week after week indoors running really fast. Outdoors, the guys in Europe ran really fast. There was no holding back. When it came to the Fifth Avenue Mile that year, Fred literally told us that it was taking place, asked us to run and it was understood that we were going to show up because Fred and the New York Road Runners club was well know for taking care of the runners. When the Fifth Avenue Mile had really good sponsorship with Pepsi Cola, the money was there, the enticement was there. It was easy for us to say yes. What did you think when you first heard about this from Fred Lebow and what are your memories of that first race? Steve Scott: I thought it was a great idea. You didn't really know what the reception was going to be like in the city. We all knew about the New York City Marathon and all the different events that were held in New York and we just hoped that it would have the same reception as those events, and it did. From a tactical point of view it was a difficult thing to adjust to. From a social point of view it was great because it was at the end of the season, and it brought all of the great milers together in one place. The Road Runners treated us like kings and we went out afterward to Studio 54. It was a great event and from that year forward, every miler was looking to get an invitation to the Fifth Avenue Mile. The race record of 3:47.32 by Sydney Maree still stands. What do you think some of the reasons for the longevity of that mark and do you remember thinking that it was a really fast time on that day? Ray Flynn: At that time, miling was so exciting and there were so many records being broken all the time, and we had never run a mile in a straight line on a street like Fifth Avenue in New York City. We as athletes wanted to see how fast we could run in a straight line. We didn't have experience where to kick or what to do. We just ran as fast as we could right from the gun. With that and the atmosphere from the crowds that lined the streets, I think that's what brought about this fast result. Steve Scott: That first year we were all kind of ignorant. We didn't really know what to expect. We were very aggressive and everybody ran really hard thinking that finish line was a lot closer than it was and people tried making moves early. I think in subsequent years the race was run more cautiously. Plus it wasn't a track race where you had to worry about Track & Field News rankings. During that time, everybody wanted to be ranked very highly by Track & Field News and since it was a road mile it didn't count. We could ran as fast as we could and if we didn't win it didn't matter because it wasn't going to count against you. Eamonn Coghlan: Unlike a track race where there are four laps to the mile and you can pace yourself through the first 440y, 880y, three-quarter miles and know exactly where you're at and what time you're running, we were going from gun to tape all out without knowing where we were with each split. We were able to be right there until about 200 meters to go but Sydney just wanted it more than everyone else. It was that hunger that made him run 3:47 point. When you look at the field, it was the caliber of an Olympic field and that's without Seb Coe and Steve Ovett who weren't there. Do you think this was the best ever era of milers? Steve Cram: I think so. I was chatting with some people today and the memories are still very vivid for fans of middle distance running and miling in those days. The race was actually televised by the BBC back home and the reason for that was that we had these great characters. Miling at the time was perhaps the biggest story in the U.K. especially with what Coe and Ovett had done at the Moscow Olympics the year before. There was huge interest in the field and huge interest in this new event. There remains such a fascination with the mile. What is it do you think about the mile that makes it such a compelling event for the public to follow? Eamonn Coghlan: I think there is a magic about the mile, whether its four minutes, or four laps to the track or straightaway down Fifth Avenue. I think the common person out there may not understand how good 3:26 is for 1500 meters but if you say somebody has run a 3:59 mile they can relate to that. The knowledge, the tradition and the history of the mile is engrained in people's minds. Sydney Maree wasn't able to race often because of the political situation he was in being from South Africa. For that reason, did you suspect that he had extra to prove in this race compared to the guys who had pretty full seasons? Ray Flynn: I think Sydney was a front runner and he liked to push the pace. This was an opportunity for him to do that against the world's best milers. If you look at how he raced, he always liked to go out as hard as he could. He was close to the front the whole way in that race. Steve Scott: He also very much liked to make a political statement. I think because of what he was going through at the time. This was a perfect chance. The race was going to be shown worldwide He didn't get the opportunity to race as much as others so this was a great chance for him to state his case politically. Sydney Maree what an amazing runner! I love you daddy!